If you have ever been to Korea, then you would have seen Tteokbokki sizzling in large woks along many street stands. This is one of Korean snacks that especially flavored and made to fit the cold season. 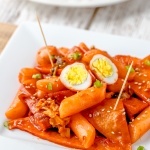 Tteokbokki, in short, is term for Korean rice cakes, which are naturally bland but very chewy. These cakes can be stir fried, in soup, with curry etc…There are many styles and variations of Tteokbokki, but the spicy from Gochujang chili paste is the most traditional one. This recipe is aimed at the most authentic flavor, that is to season and flavor with Yuksu, a type of Korean stock that is similar to Japanese dashi. The stock combined the umami of both kelp (seaweed) and dried anchovies (the fish behind authentic fish sauce). If you’re vegetarian, then just skip the anchovies and adjust the sauce with vegetarian fish sauce to imitate. Another note is on the sugar, I used palm sugar to enhance the sweetness, but you can also just use regular raw sugar or syrup. The idea is to thicken and color the rice cakes nicely. Depend on your spice tolerant, it might be necessary to add extra or skip the chili flakes. 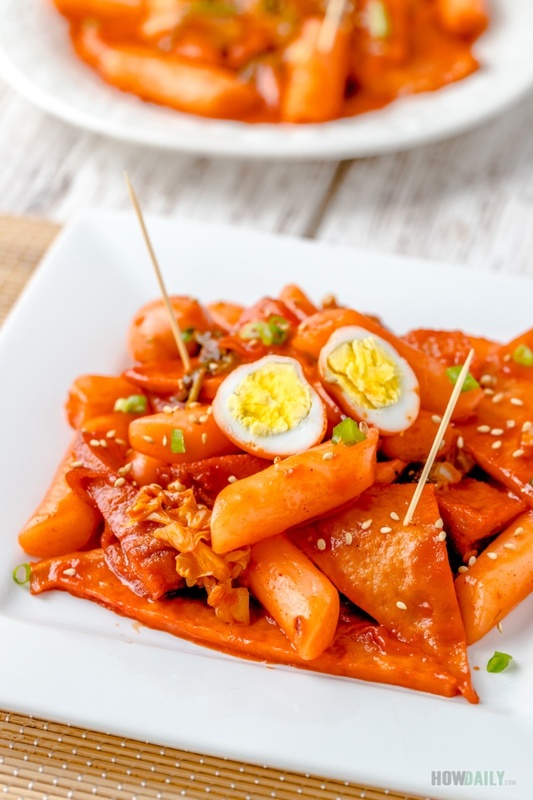 Though, they surely make Tteokbokki more appealing along the thick red coating. 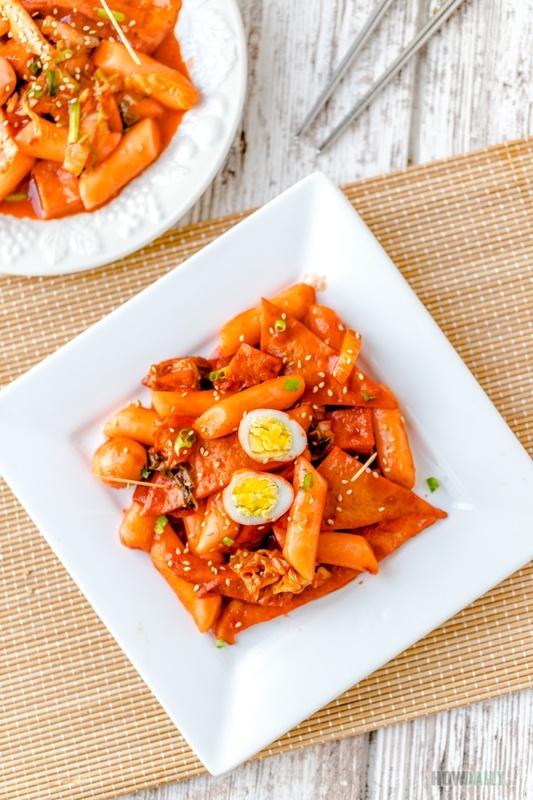 Gochujang is spicy in its own, so when combine with everything else to make Tteokbokki, it might not be a good idea to let the kid digging in. Though, this is the perfect snack or main (when eaten with noodle, pasta or ramen) for teens, parties or any spicy fans. 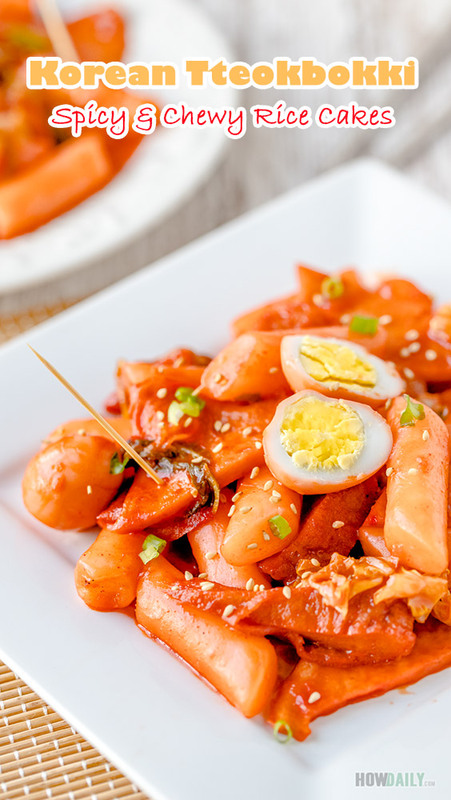 Tteokbokki is not hard to make, the most tedious thing about it is just gathering all the ingredients, especially if you’re not closed to a Korean or International market. Most major grocery stores may carry bags of Korean rice cakes and Gochujang in their international aisle, but the fish cake is harder to find. Online groceries would be a better choice if you’re in this situation. So maybe order in bulk and store them in freezer. 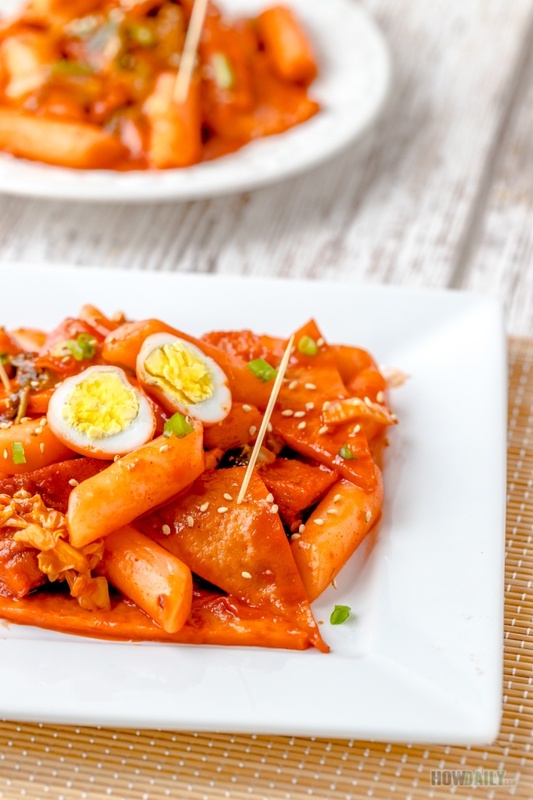 Fiery and chewy Korean rice cakes that fully covered in the thick hottest red chili sauce, this is the flavor that is just too bold to forget. Enjoy this as snack or with side noodle. In a large pot, fill 6 cups of water. Soak dried kelp in this water for at least an hour or overnight. When ready, turn heat to low-medium and bring this pot (with kelp inside) to boil. Keep boiling for about 10 minutes, remove the (now) enlarged kelp. 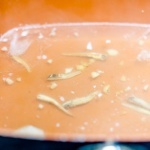 Lightly rinse dried anchovies (or dried shrimp, skip if use bonito flakes). Add this umami ingredient to water pot. Chop off the root, and throw the white parts of scallion into pot as well. Make sure heat is on low, simmering with cover for 40 minutes. Keep a small piece of folded paper towel between the lid and pot to avoid overflowing. When done, strained through a sieve, discard the solid. Let the liquid cool down, divide into portions and store in freezer for subsequent uses. This will be your Korean soup stock, can be used for Tteokbokki, noodle, etc..
Hard boil the quail eggs or eggs. Then remove shells. Wash, rinse and separate all rice cakes. Take about 3 cups of the Korean stock above and add to a pot or deep sauce pan over medium heat. Add rice cakes and bring to boil. Stir in all the sauce seasoning: gochujang, soy sauce, sugar, minced garlic and ginger. Lightly wash to remove extra oil from the fish cakes, cut into smaller pieces then add to boiling soup pot. Add the hard-boiled quail eggs to pot also. Add those optional ingredients if use (extra chili flakes, cabbage). 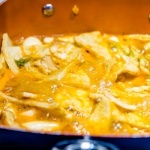 When the rice cakes are fully cooked and soften, turn heat to low and keep simmering to thicken the sauce. Chop scallion and then add them as well as sesame oil to pot. Stir to fully mixed. Serve tteokbokki warm with some roasted sesame sprinkle on top. For deeper flavor, just simmer tteokbokki longer to thicken the sauce. If you like to enjoy them as hot soup, add extra dashi stock and ramen, noodle or similar. When making Yuksu stock, the soaked kelp afterward can be saved for salad, sweet soup or cold appetizer.